• 2CD history of King Crimson featuring many extracts & tracks appearing on CD for thefirst time. • Originally available only at concert venues on King Crimson’s sold out European 2016 tour. • Much sought after by fans, hence more widespread release. The Elements tour boxes were devised specifically for the King Crimson tours but have since gone on to great success with fans with both 2014 and 2015 editions becoming firm sellers. 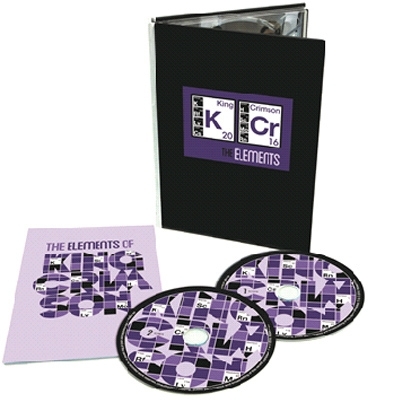 The depth & variety of King Crimson’s archives allows for the presentation of such “alternate best of/introduction to…” style releases, providing a fascinating audio history of the band featuring extracts from rehearsals, new live recordings, elements from studio recordings, full tracks, alternate takes & finished recordings from 1969-2015, many of which make their first appearance on CD. Every line-up is featured across the 2CD set. The set also provides tantalising audio extracts & hints of forthcoming King Crimson releases. The accompanying booklet features sleeve-notes by co-compiler Sid Smith, photos of memorabilia, full info about the current tour & a number of band & individual photos of the line-up.